This work continues my interrogation of colonial collecting and of Australian colonisation. I imagine history is an unfaithful lover, in his own bubble with his lies, seduction and manipulation, only seeing from his position. 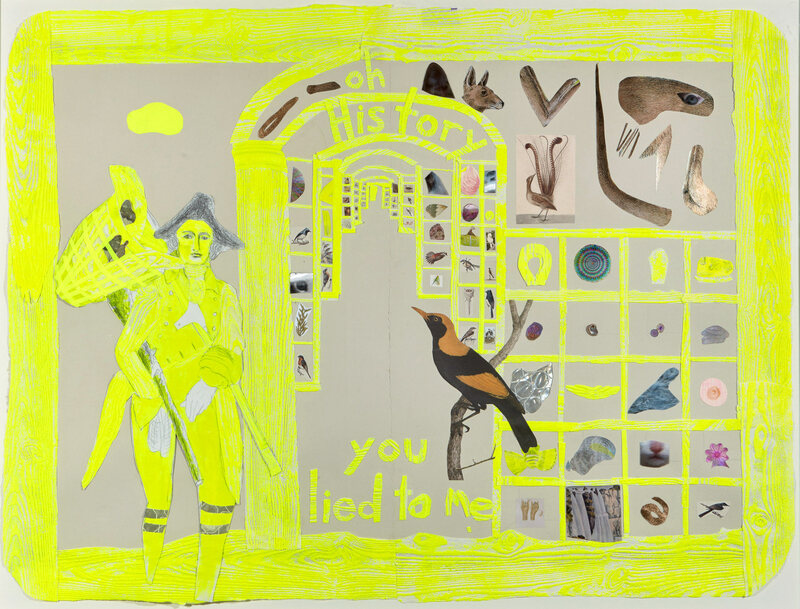 Recreating the Leverian Museum, a catacomb of curiosities including those from Captain Cook’s voyages, and using my signature hi-vis as a metaphor for colonisation, I am critical of the collecting mentality as an ongoing disease fuelled by superiority and greed. Recontextualising Thomas Gainsborough’s Mr Andrews (from his painting Mr and Mrs Andrews c1750) as the arrogant ‘butterfly murderer’, I render him unconcerned for the damage his infinite collecting causes.